1. Do not use any of the GUI editing capabilities of Eclipse for this assignment. Do all the GUI layout work based on what you have learned in class in the last 2 weeks. 2. You can use either inheritance or composition to get a JFrame into your application. 3. All member variables must be private. 4. The GUI and event handling setup must be done in the constructor of your GUI class or in private methods called from the constructor. Hint: it would seem logical to have a private method to build the top, left, and bottom panels. 5. 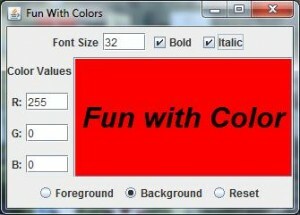 The main text field (the red one above) will be used to show the results from the selection of font size, bold and italic selection, and foreground and background color selection. 6. The display must have a label and JTextField where the user inputs a font size value and which must appear in the upper part of the frame as shown above. 7. There must also be 2 check boxes that will control whether the font has bold and/or italic characteristics and which must appear in the upper part of the frame as shown above. 8. There must be a set of 3 radio buttons which are used to set the foreground and background colors of the main text field (the one in red above). The third button is used to reset the background of the main text field to white, and the foreground of the main text field to black. The three radio buttons must appear in the bottom part of the frame. 9. There also needs to be a set of 3 text fields used to input the values of the red, green, and blue color components (in the left panel above). These values are used when the foreground or background radio buttons are selected. These text fields and their labels can appear on either the left or right side of the main text field. a. Enter key in the font size text field causes your program to respond and change the main text field to display its text string using the new font size. The current style should be maintained… so if the font was bold before, the new display still has bold text. b.	Clicking on either the bold or italic check boxes causes your program to respond and change the main text field to display its text string using the new bold / italic setting. The current size of the text in the text field should be maintained. The possible combinations here are not bold and not italic, bold and not italic, italic and not bold, both bold and italic. c.	Clicking the reset radio button causes your program to respond and change the main text field background color to white and the foreground color to black. d.	Clicking on the foreground color causes your program to respond and convert the string values from the red, green and blue text fields to numbers that must be between 0 and 255. If a value is more than 255, just set the value to 255. Then the foreground color of the main text field is set to this new color value. The current background color is not changed. e.	Clicking on the background color causes your program to respond and convert the string values from the red, green and blue text fields to numbers that must be between 0 and 255. If a value is more than 255, just set the value to 255. Then the background color of the main text field is set to this new color value. The current foreground color is not changed. f.	Only one of the radio buttons is allowed to be selected at any time. Also make sure that you add comments to your program! Take screen shots of the program showing bold and italic font and some combination of foreground and background color. 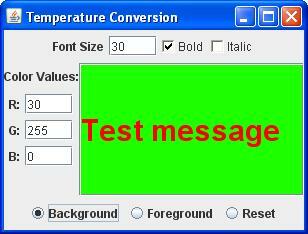 Paste the screen shots and the source code for your program into a Word document.